In a warm, welcoming Gaithersburg, Md. 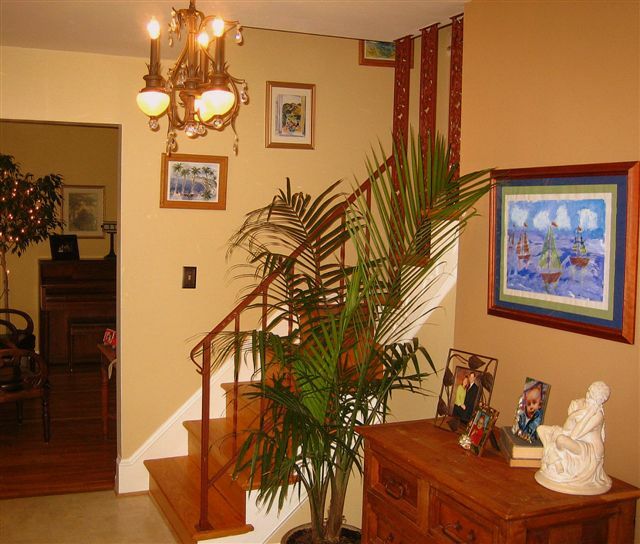 foyer, spirited prints by French Fauvist Raoul Dufy flank a stairway, a few feet away from an equally spirited drawing by the homeowner's child. With themes of sailboats, beaches and animals dominant both in Dufy's coveted portfolio and in the child’s unfiltered repertoire, at first glance distinguishing one from the other may be a challenge. But that’s precisely what Owner/ Principal Cindy Griffin of CMG Interiors had in mind when creating the livable, seamless, family-oriented space. Having made interior design for growing, active families a special kind of niche, Griffin is an active mom herself whose website espouses the value of fruits and vegetables, snow, blowing leaves and beach sand in her life. Accordingly, she factors in ideas and objects from both her clients and their children when reimagining their residences. “They have very busy lives running their households, their jobs, their kids’ lives, school, volunteer work—they may have little time to focus on updating or even initiating a room,” Griffin said of her clients, adding everyone, including kids, feels differently about a space. Accordingly, the designer makes it a practice to ferret out existing items like art (children’s and other), keepsakes, travel mementos and additional elements the family has acquired and/or developed over time, often making them features or focal points of her renovations. What’s more, Griffin said “shifting, relocating, reusing and seeing things in a new light” is the key to an effective, family-friendly, transitional redesign of a space, as is an unhurried approach — or developing that space over a considerable period of time if appropriate. In a thought, families grow and change and so do spaces. In the Gaithersburg foyer, a late 1960s high gloss white metal hand rail is something many designers would have jettisoned, Griffin said. Electing to paint it a more classic dark bronze, the designer added an elegant old world-style chandelier, chest of drawers with a raw antique feel and rustic metal handles, lush, leafy plants and an organic color palette to a space that might have otherwise been overlooked. “We added photos of the children and left the wood stairs unpainted and without a rug,” Griffin said. 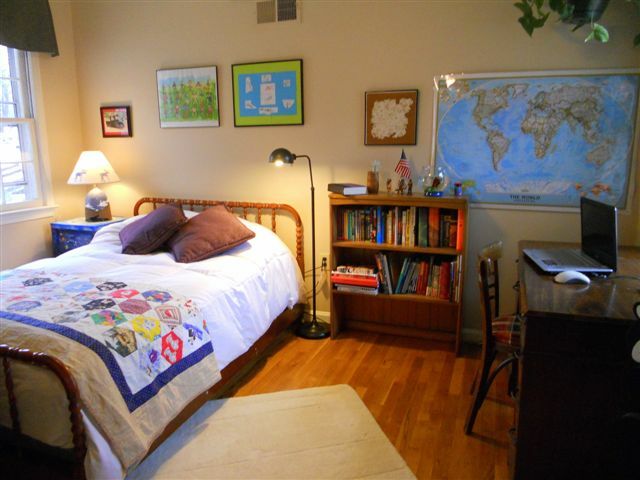 The addition of the Dufy prints and parallel child’s artwork makes the space more of a vignette, she added. In the family’s living room, Griffin used “layering” to enhance and organize the space. Relocating a piano and retaining the sofa, coffee table and rug, the designer created a concentrated seating area, dedicating the room’s perimeter to less utilitarian, less used and more decorative objects. “You need to have a cozy conversation group that’s easily reachable,” she said of the space’s center, framing and displaying more children’s artwork as a focal point. Because the living room is a northern exposure, Griffin used a golden color on the walls to warm it up, and made sure to include lighting in all four corners. “Lighting this way goes for any room to make it feel even,” she said. In the designer’s own child’s room, also in Gaithersburg and created when he was 3 years old, cherished family pieces yielded a bright, personal, comfortable and comforting space. A handmade quilt from his grandmother that includes Depression-era fabrics, a lamp that was a wedding gift to his parents—replete with a hand stamped moose representing his favorite tome “If You Give a Moose a Muffin,” and an end table that was a second grade project containing artwork from the entire class punctuated and personalized the room. 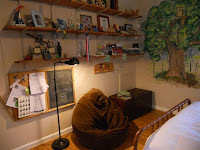 A mural of a large, lush, verdant tree, painted by Griffin herself, symbolizes the tree of life and its positive energy, and a framed self-portrait from kindergarten along with an i mage of the child with his grandfather in a homemade life-sized train created a very special environment. Over time (Griffin’s son is now 15), and though he elected to preserve his mother’s cherished mural and a few other childhood elements, furnishings like a bean bag chair and objects like a world map, and brown and white artwork—which is paper he made from plants, glue and water— accommodated his maturing interests and studies (the paper won a blue ribbon at the Maryland County Fair). “The room has grown with him,” said Griffin, though it continues to nurture, retains his true character and connects him to childhood and family. Hey Cindy, what a terrific story illustrating your design philosophy. The photos of your lovely home clearly show your talent for designing comfortable spaces for family living. Thanks for sharing it and keep up the great work! I have known and worked with Cindy for the past 10 years, and this article captures her spirit and philosophy so perfectly! Kudos to the designer and the writer! Very nice article,Cindy that expresses your ideas on design, home and family very clearly, both visually and editorially.It also shows your great sense of color. I hope lots of people will see this article and know what a talented designer you are.